If you are looking for a traditional style single Pedestal Table then this is the perfect choice. This pedestal table is Amish handcrafted in Indiana using Old World craftsmanship techniques. Each Amish dining table is handcrafted by skilled Amish woodworkers here in the USA. This Amish table is sure to become a treasured family heirloom that is passed on for generations. 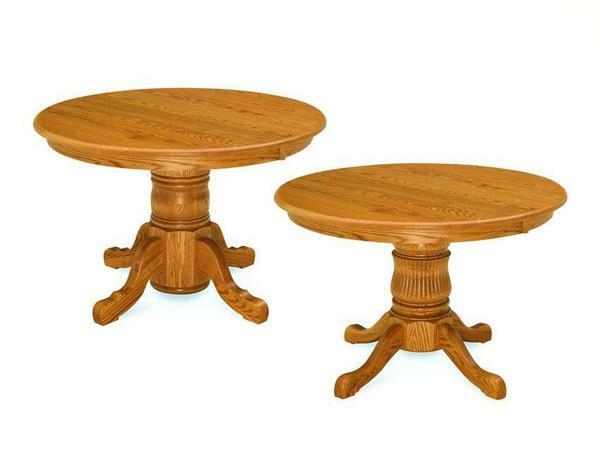 Be sure to review our entire line of Amish Pedestal Tables to find the one that best reflects your personal style. All of our Amish dining tables are built to last. Enjoy a dining table of heirloom quality that is sure to be passed on to future generations. Call one of our Amish Furniture Specialists today at 1-866-272-6773 wih any questions. 3rd Leave Not Available on 36" and 60"